Students learn about literary elements, such as plot and characters, across a number of literary genres. They also do some creative writing. Foundational Skills unit contains 6 learning experiences. Each learning experience takes about 45 minutes to teach in the device-enabled classroom. Students listen actively to oral instructions and ask clarifying questions as needed. Then they practice their listening skills by following instructions, as well as restating instructions to show comprehension. Finally, they practice giving clear instructions. Students learn dictionary skills to help find meaning, pronunciation, and syllabication of familiar and unfamiliar words. Then they work in groups to go on a dictionary scavenger hunt. Finally, they learn that some dictionary entries include synonyms and illustrations. Students learn to use context to determine the meaning of unfamiliar words and words with multiple meanings. Then, they write their own sentences to use context to give meaning to unfamiliar words chosen from a dictionary. Students learn to read and write words with prefixes and suffixes. Then they learn how prefixes and suffixes affect the meaning of base words. Finally, they build real and made-up words by combining affixes and roots from a list. Students learn common word roots, prefixes, and suffixes. 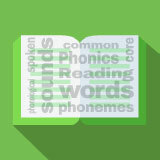 They also explore how knowledge of roots and affixes is a strategy for vocabulary comprehension. Then they combine the word elements and use their newly acquired words in sentences. Students increase their spelling skills through identifying, explaining, using, and spelling homophones. including the Foundational Skills Unit.